The pole has recently begun to move more quickly, prompting researchers to update its official position sooner than planned. 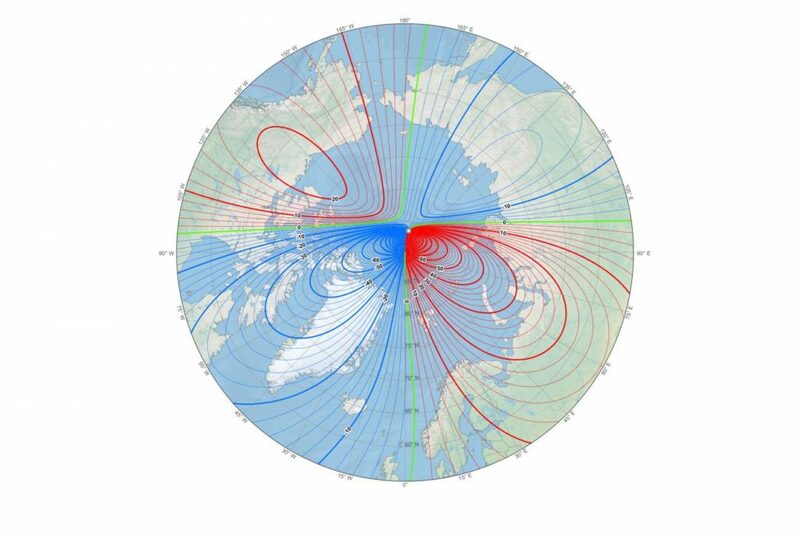 On Monday, researchers updated the official location of the magnetic North Pole. The World Magnetic Model, which is maintained by the National Oceanic and Atmospheric Administration and the British Geological Survey, is usually updated every five years. It was due for recalibration at the end of this year. However, due to rapid and unforeseen changes in the Earth’s magnetic field, scientists released a new version earlier than planned. The update was slowed by the recent U.S. government shutdown — many NOAA researchers were furloughed — so the announcement was postponed from January 15 to February 4. James Clark Ross first measured the magnetic North Pole in 1831, in what is now Nunavut. It was already moving toward Siberia, but in the 1990s it picked up the pace, from about 9 miles every year to 34 miles per year. Last year, Nature recently reported, the magnetic pole crossed the International Date Line into the eastern hemisphere. Some shifts in the Earth’s magnetic poles are expected; as the molten core of the planet ebbs flows unpredictably, the magnetic field seems to change. But this movement is happening faster than scientists expected. Some have posited that there is a “tug-of-war” of magnetic activity in the Earth’s center. Being able to locate the magnetic north correctly helps militaries, airlines, search and rescue crews, and others operate safely in the region. It also helps provides accurate location services for people around the globe.